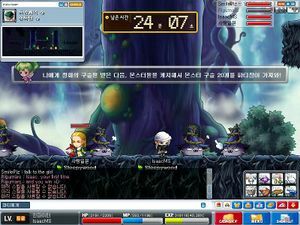 Forest of Poison Haze is a Cross World Party Quest based on Ellin Forest. 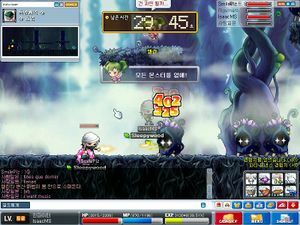 It can be completed by four players from levels 70 and above. To enter the Party Quest, one must enter the Cross World Party Quest portal at Spiegelmann's Guest House while this Party Quest is part of the current rotation. 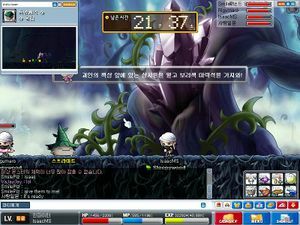 The rotation also consists of Moon Bunny's Rice Cake, First Time Together, Remnant of the Goddess, and Ariant Coliseum. Upon entering, the party will be transformed to look like citizens of Ellin Forest, based on their job: Athena Pierce (Archers), Kanderune (Warriors), Perzen (Magicians), Lohd (Thieves), and Yuris (Pirates). The first stage of the Ellin Forest Party Quest has a simple goal: merely defeat all of the Poisoned Tree Lords. Once they are all defeated, you may advance to the next stage through the portal on the right side. The Poisoned Tree Lords are mostly on platforms above the floor, so it's a good idea to split up the party into one person per platform for the most efficient method of clearing it. In this room is an enormous poisoned tree with a bulbous green growth near the base. As you enter, numerous Poisoned Stone Bugs will begin to spawn. These bugs have Super Weapon Defense up ability. Once killed, they will drop a purple Venomous poison. Take it and click on the green poisoned tree to make a pink Diluted Poison. After 4 of the antidotes have spawned, you must take them to a thorn bush at the far right of the stage and click on it. Each diluted poison heals the thorns some, until they finally disappear and you may continue on your way. This stage contains no monsters, however it presents a maze of portals. In order to progress, the party must split up and find the route to the bottom right corner of the map. 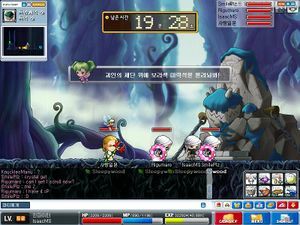 Only one member of the party must reach the end, and upon talking to Fairy Ellin, will proceed to the next stage. Stage 4 of the Poison Forest is populated by the Poison Sprites. In order to clear this stage, the party must kill all 20 of these poison sprites and collect 20 of the marbles dropped. This stage is a jump quest. First, the party must climb up ropes in order to reach the jump quest area. Then, they need to split up and jump to one of 3 ropes at the top of the map. Players climbing the ropes must take care to avoid the flying throwing stars. Upon climbing all the ropes, the party member must click all the wooden boxes up there in search of a Purple Magic Stone. Once it is found, the party can proceed to the next stage. This means that if the first person up finds the stone, the other parts of the jump quest won't be necessary to complete. This is the boss area. To summon Poison Golem, the person with the stone must click on the bound golem statue. 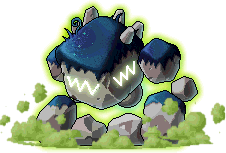 Poison Golem's first form will appear. The first form is rather weak, and so it should not take more than a minute to destroy. The second form is much more annoying, as it can cast large poison clouds, which deal 200 damage per second, making it difficult for melee classes, particularly infighters and bandits, to attack. It also casts darkness and weakness on the entire party. Finally, the third form is the most dangerous of all. In addition to having the abilities of the second form, it can summon Poisoned Tree Lords, Poisoned Sprites, and Poisoned Stone Bugs. It can heal itself for about 25,000 - 26,000, as well as all surrounding monsters. The most annoying ability of all is the reverse key, inverting the controls. This causes the left arrow to move your character right, right to move left, and worst of all it cannot be dispelled by using a All-Cure. After defeating the Poison Golem, it will drop a number of potions, like Lord Pirate and Frankenroid. The party can now exit the area through a portal on the right side of the map. 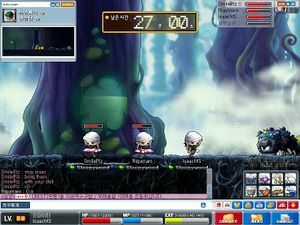 In here, simply talk to Ellin to exit. You will already have changed back to your normal appearance. You receive 10 Party Points. These can be exchanged for items from NPC Pub in Spiegelmann's Guest House. 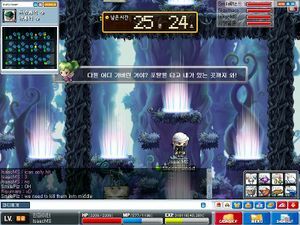 You can buy items such as chairs, scrolls, Party Quest Equipments and damage skins. Must kill 50 of these to complete Stage 1. Appears in Stage 2. It drops Concentrated Poison, which must be taken to the pond in the middle of the map to Dilute the poison and destroy the thorn bush. It can cast Weapon Defense Up and Cancel Weapon Attack. Must be killed to obtain Monster Marbles in Stage 4. Summoned by Charged Poison Golem and Super-Charged Poison Golem in quantities of 5. Summoned by Super-Charged Poison Golem in quantities of 5. Unlike the other Poisoned Stone Bug, this one has no defensive buffs. Summoned by Super-Charged Poison Golem in quantities of 5. The first form of the boss of the Party Quest. It has two attacks: it can either punch the ground or cause an earthquake with its body. It can also make a poison mist which deals 50 damage constantly. When it dies, it respawns as Charged Poison Golem. The second form of the boss of the Party Quest. Its physical attacks are now replaced by a magical attack which deals roughly the same damage. Its Poison Mist now deals 200 damage constantly. When it dies, it respawns as Super-Charged Poison Golem. It can inflict poison, weakness, and darkness on the party, so be sure to bring all cures! The third and final form of the boss of the Forest of Poison Haze Party Quest. It has some of the same skills as the second form, as well as a few new ones. This page was last edited on 23 February 2019, at 12:50.